Marc Bonnier – who piloted Kofler on his initial flights in Egypt some time between 2-12 January 1914, was one of three French pilots competing to be the first to fly from Paris to Cairo. Pierre Daucourt had crashed in the Taurus Mts of southeast Turkey. A second, Jules Védrines, reached Cairo first on 28 December 1913. However, Védrines and Bonnier had reached Istanbul together on 3 December 1913, been held up there together for a fortnight then set off on 17th December and spent the night at Iznik before continuing to Konya on 18th, where they met up for the last time before Cairo. Iznik today, as seen in Google Earth. An Anonymous article published in the magazine L’Illustration of 10 January 1914, surveys the experience of the Bonnier and Védrines between Istanbul and Cairo. 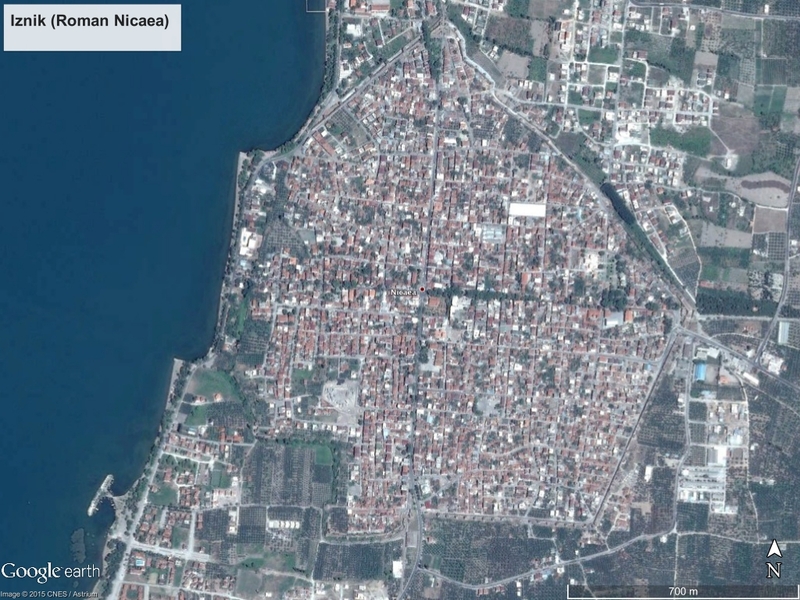 Particularly interesting is the photograph below of Iznik – dwarfed by the extensive ancient city walls of Roman Nicaea. Bonnier referred to it in his quoted correspondence with the magazine and the caption credits the photo to his passenger/ mechanic, Joseph Barnier. The photograph was evidently taken as they left Iznik on 18 December 1913 and was intended to capture the very striking archaeological remains. 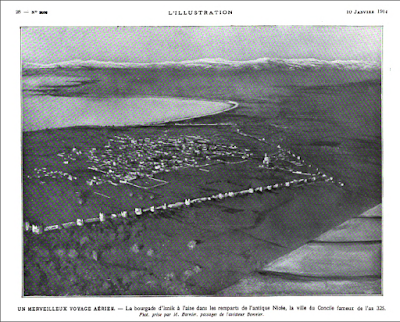 Barnier is surely again the photographer during the next stages with other aerial photographs of archaeological sites in subsequent articles in L’Illustration and Lectures pour tous, of Tripoli (taken between 21-29 December 1914), Acre (31 December 1913) and Jerusalem (1 January 1914). What became of the negatives or even the original prints is unknown (to me, at least). The published versions in the magazines are relatively high quality, not least that of Iznik (though that below is a poor scan from the digitized copy of the magazine). The photograph of Iznik published in Anonymous (1914) “Paris - le Caire en aéroplane”, L'Illustration, nr 3698 (10 Janvier): pp. 28-29. These may well be the earliest photographs of archaeological sites taken from an aeroplane anywhere and almost certainly the earliest in the Middle East – as much as two weeks before those taken by Kofler in Egypt. The end of the search? Maybe not … Had Bonnier/ Barnier already taken aerial photographs of places seen during their flight through the Balkans? And – more particularly, of Constantinople, where he was held up for two weeks with his aeroplane at San Stefano (site of the current Ataturk Airport)? And then there is Oswald Watt, the commander of the Australian Flying Corps Squadron 1 in Egypt and Palestine in the latter part of the First World War, who had been in Egypt 2-3 years before. Coming from a wealthy Australian family and already holding one of the earliest pilot’s licences, he had been granted a messy and scandalous divorce in June 1913 and immediately afterwards travelled to Egypt to take over an aeroplane he had bought. He then remained there through much of 1914 till volunteering his services and his aeroplane to the French government at the outbreak of war in August. Rich enough to own an aeroplane … and a camera? He survived the war but died in a silly accident a few years later. Anonymous (1913) “Aviateurs espagnols blessés en guerre”, L’Illustration No. 3696, (27 Décembre). Anonymous (1914) “Paris - le Caire en aéroplane”, L'Illustration, nr 3698 (10 Janvier): pp. 28-29. Bonnier, M. (1914a) “Impressions d’aviateur en Orient. D’Adana au Caire par les Lieux Saints”, L’Illustration 3701 (31 Janvier): 76-7. Bonnier, M. (1914b) “Quand je volais au dessus des Pyramides”, Lectures pour tous, 15 (1 May): 1270-1280.